Serge Romano, Coraggio Advisory Board Chair shares his beliefs on the fresh ideas in a collaborative, supportive environment. 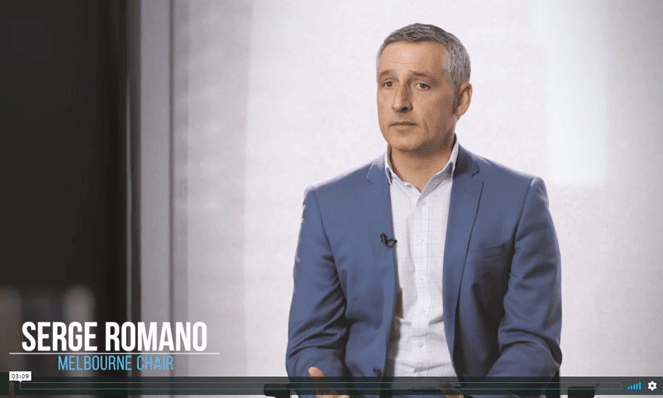 When you become a member at Coraggio you receive a full day introduction which encompasses meeting the Board, the members and the learnings for that particular day. We offer state of the art facilities for our board meetings, which are held in the same location every month. There’s no worrying about where the next meeting is going to be or whether you’re responsible for providing a venue which is the way many other companies operate. I have to say the facilities are fantastic with meals and drinks catered throughout the day. We also offer a social get together after the board meeting, which I think is important when it comes to the connection of the Board. It’s part of the ambience. You become part of a bigger and wider community at Coraggio, as there’s opportunity to interact with people within the membership of your state and other states as well. The annual membership covers the monthly Advisory Board meetings, but there’s also the opportunity for one-on-one mentoring with your Chair. This allows members to work through any further issues or opportunities related to their business. Our meetings are very structured. We start in the morning talking through things that need to be addressed. This is followed by a guest speaker who either have their own business or have expertise in a specific area we want more information about or understanding of. It’s a great learning experience. The rest of the day incorporates more Board discussions, problem solving and assessing identified opportunities. There’s usually some prep or homework to be done before the next meeting. It’s a creative and productive environment, apart from the learnings from the day, the most important thing is that you are taking a break from the daily pressures of your business and soaking in new ideas. Fresh eyes and fresh perspectives. We all know that it’s easy to get trapped into spending too much time IN the business, rather than ON the business. Board members really enjoy the opportunity to step away and get some perspective. It’s refreshing, invigorating and enjoyable. Just the other day one of our members said that, because of what he heard and learned from one of the speakers, he’d already had his value for the entire year. The value to me is to make a contribution and to be part of it and to see the results of that process. Some people, when considering joining Coraggio, initially think it unnecessary because they already have two or more partners involved in their business (a quasi-board). My answer to that, more often than not, is that sometimes you can get quite stale in your approach. Getting fresh ideas and thought processes is really important, as is being challenged by people outside your immediate environment. Others don’t have a Board of any kind and they know too well that running a business can be a lonely and isolating thing. I hear that a lot from members and they find the experience at our monthly meetings extremely valuable. They’re able to share their thoughts and ideas and get constructive feedback that they simply wouldn’t have been able to get in their own work environment. When deciding whether this is something for you and your business, I always think it’s a good idea to come to our introductory days, talk with some of the other members and get an understanding of what this is all about. It doesn’t matter what you’re buying – a car or a home for example – you want to get as much information as possible. So, you’re most welcome to come and talk with those who are already members and see if it’s for you. We want to make sure that this is for you and your business, but we also want to make sure that we get the right members to ensure that we’re the right fit for you and you for us. It’s really important to get the right people involved and for you to get the benefit you want. I would really encourage you to find out more.